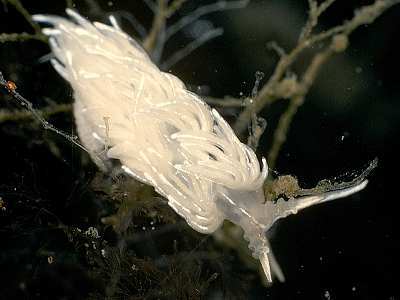 Description: This recently described nudibranch is translucent white with broken lines of white surface pigment on the cerata and along the midline of the back. There are three large annulations on each rhinophore. The distal portions of the rhinophores and the long oral tentacles are pigmented with white. 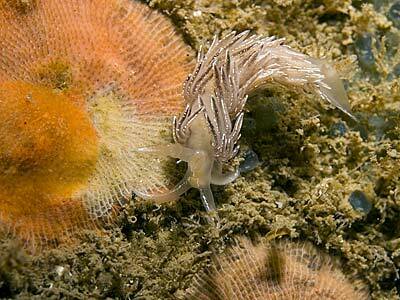 Habitat: This species feeds on the eggs of other nudibranchs and is likely to be found in small numbers wherever other nudibranchs are abundant. It lays a convoluted white string of eggs, normally coiled around hydroid stems. Distribution: Found more commonly on the north and west coasts of the British Isles, this species is recorded from Norway and as far south as Galicia, NW Spain. Rhinophores with three conspicuous annulations. White surface pigment in dotted or broken lines. Picton, B.E. & Morrow, C.C. (2016). Favorinus blianus Lemche & Thompson, 1974. [In] Encyclopedia of Marine Life of Britain and Ireland.